Facebook allows his users to quickly share the information, messages and photos with others. Your Facebook friends allows to downloading the profile photo at his device. But if you want to stop them, you can easily stop downloading FB profile picture. You can prevent any visitors to stop downloading Facebook profile picture. To do this job, you must have to change the simple thing in privacy setting to protect your Facebook profile picture. All we know there are lot of users spend his vacant time using the social networking website Facebook. Facebook is a popular free to use social networking website. This website allows his registered users to create profiles, upload photos and video, send messages and keep in touch with friends, family and colleagues. Facebook is available in 37 different languages, including different public features. Due to lack of privacy any visitor easily download your profile picture at his device. It is not so good as per the security. There are lot of features on Facebook which we don’t know. Today in this article we have to discuss about how to turn on profile picture guard feature. This feature allows you to quickly lock your profile picture with others. If you relay want to stop downloading FB profile picture with other visitors, then you must have to take few simple steps. You must have to turn on profile picture guard option to keep safe your FB profile picture. Step 1: First, you have to log into your Facebook account. After login to your Facebook account, you have to change your Facebook account privacy setting. Step 2: Open the home page of your Facebook account. 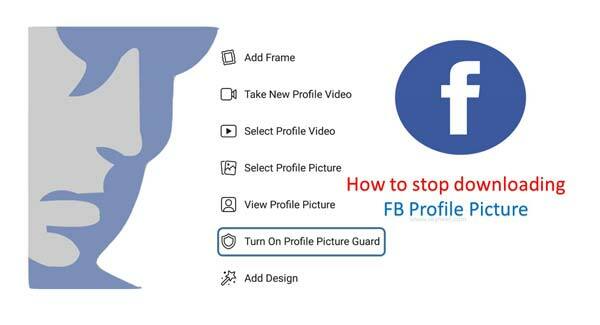 Tap on your Facebook profile picture and “Turn on Profile Picture Guard”. After turn on this feature your FB profile picture is saved. Nobody download your Facebook profile picture without your permission. I hope after reading given simple steps you can quickly stop downloading FB profile picture at your smartphone. If you have any issue regarding this article, then please write us your query in comment box. Thanks to all.